German automobile manufacturer, Audi, has shocked the world by releasing its water vehicle; an electrically powered foil board. The Audi e-foil as it is called is expected to be one of the most advanced electric foil boards to hit the market in 2019. The vehicle was birthed from Audi’s e-tron program and was unveiled at the Consumer Electronics Show (CES 2019); a public showground for getting consumers acquainted with upcoming cutting edge technologies and innovators. 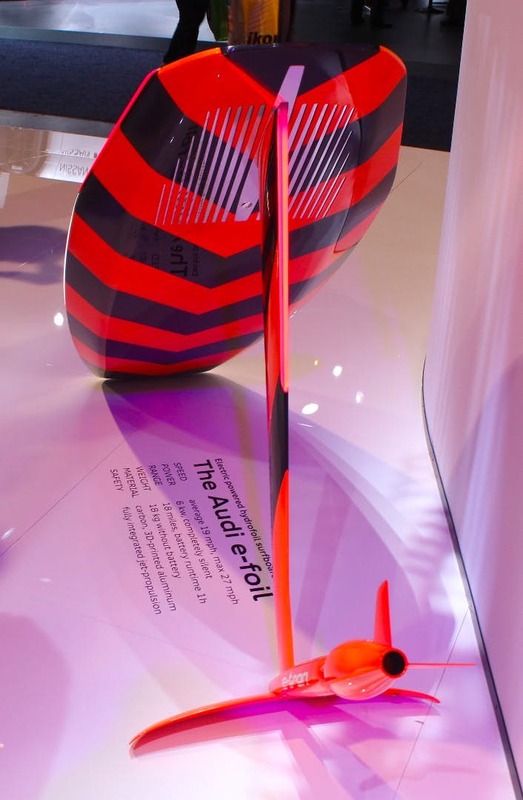 Waydoo Flyer; an affordable Chinese electric hydrofoil was also unveiled during the program, but it appears that Audi’s e-foil managed to steal the show. Boasting of speeds reaching up to 27 mph (43 km/h), the Audi e-foil carries its riders sky-high as it skillfully cuts a path through the water. The device appeared to be “smart” and constructed with the specific purpose of thrill, speed, and efficiency. Where did Audi e-foil come from? The dream of this project begun with Audi engineer, Franz Hofmann who worked on Audi hydrogen tanks. Outside of work, Hofmann was an enthusiastic kitesurfer with ideas of taking his pastime hobby to the next level. He envisioned a hydrofoil which will serve to assist his kitesurfing efforts. To achieve this, Hofmann turned to his friend, aerospace engineer, Christian Rössler; together they both developed a unique hydrofoil which Hofmann used to travel the world. Hofmann was really impressed with their invention and decided to turn it over to Audi. The automobile company was equally fascinated with his work and saw an opportunity for advancing personal electronic mobility. Working with Hofmann, Audi supported the project which led to the development of a prototype, a much sleeker and high tech version compared to its original design. This new machine was the Audi e-foil. The vehicle utilizes a 6-kW jet propulsion drive which according to Audi is a whole lot safer and much more efficient compared to traditional propulsion drives featured on most e-foils. A closed impeller has also been integrated into the machine to help downstream stator and accelerate water, which in turn eliminates swirl, keeping the engine firing in a straight line. A handheld remote is provided for controlling the electric drive, while the foil lifts out of water at 11 mph (17 km/h). The entire board weights about 40 lb (18 kg) without the battery pack. Audi is still working with Hofmann while also testing several other prototypes. The unofficial name for these projects has been dubbed “e-tron e-foil.” The automobile giant hopes to produce a limited number of these e-foils later this year and rolling out test drives to potential buyers. Other details about the e-foil remain under wraps for now, including its pricing which Audi has said is within the five-figure range. Whether this figure will drop later on is anybody’s guess, but from the specifications we have seen, it is not going to be cheap!